I have put this report off for a while, as I was just so angry with my team. I mean, how can the manager say that the team were going to Liverpool to be aggressive and take the game to them, when the reverse was true. I saw one commentator say that he thought Saints had come to avoid losing by more than two goals. 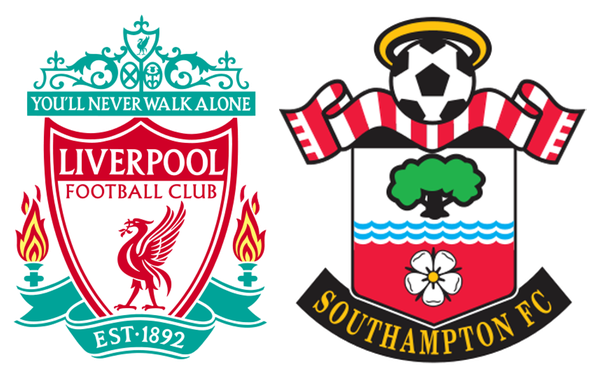 A friend, who is a Liverpool supporter and has been with us to St.Mary's several times over the years and was at Anfield last Saturday, said that it was the worst he had seen Saints play - ever. I originally saw little point in doing a blow by blow report, as Saints contribution to the game was that of a punchbag for a boxer. But I had followed Spot's example and made notes! Before we get started, just consider the statistics from the game: 39% possession, 5 shots, not one on target, 2 corners and 9 fouls. If that isn't a group of stats that prove a fundamental lack of interest, then I don't know what is. As for the team, Forster was in goal again. The back four was Cédric, van Dijk, Hoedt and Bertrand. As Lamina was injured, the midfield consisted of Romeu and Davis. Mixing it up at the front were various combinations of Tadić, Boufal, Redmond and Long. Gabbiadini was spared the pointless running around on his own this week. For about the first half hour, things were not too bad, with Saints at least trying to press Liverpool, but from the moment Tadić gifted Salah the chance to curl a superb strike for the first goal, by faffing around on the edge of the penalty area, allowing Firmano to simply take the ball from him, they simply wilted. 1-0. There had been plenty of warning of the danger, with Forster having to make several saves in the first thirty minutes and Saints looked very vulnerable to Liverpool's pacy forwards. There was just the glimmer of hope just after the goal, when Cédric managed to get a cross into a dangerous position, but Boufal couldn't make it count, with Mignolet managing to punch the ball clear. It was just an illusion though, as in a devastating move Coutinho found Salah and he darted between Hoedt and Bertrand, before curling the ball past Forster. 2-0. Either side of half-time, Saints went as close as they were destined to get as, first of all, a Bertrand free kick sailed well wide and just after half time, Boufal had a couple of half-chances, the second of which was cleared by Lovren. Forster then denied Firmino, clearing with his legs, after yet another impressive pass from that man Coutinho again. I remember thinking at this point how the Brazilian has been a constant thorn in the side of Saints, ever since Liverpool signed him back in 2013. To think we had designs on signing him back then! Just before the 60 minute mark Mauricio Pellegrino hauled off the ineffective Tadić (to be fair, he had been injured right at the start of the game) and replaced him with Charlie Austin. There had been a closed doors game against Fulham during the international break and Charlie had scored a hat trick, so maybe there was a chance that he might show a bit of confidence. Next thing of note was the booking of Romeu, which means that he now has enough points to mean that he will miss the next home game against Everton. If Lemina is still missing, that doesn't bear thinking about. The third and final goal was painful to watch, as the Liverpool forwards danced around a static Saints defence. Mané (Oh, how we miss him!) found Firmino, whose shot hit Forster and the ball rebounded to Coutinho, who then had a simple tap in to score. 3-0. Thankyou and goodnight. Game over, although as a contest it had been over after the first goal. Ward-Prowse then replaced Boufal and shortly after, Gabbiadini came on for Long. It made not a blind bit of difference to the result. There was still time for van Dijk to make a last ditch interception from an Oxlade-Chamberlain cross. The final whistle came as something of a relief and it was noticeable that Oxlade-Chamberlain came across to applaud the long-suffering Saints fans, while the Saints players disappeared down the tunnel. I just don't see how the club can continue doing the same things over and over again and expect things to turn around. This is simply a recipe for failure. There seems to be a strange malaise over the whole club at the minute, with all the teams underperforming and a complete lack of leadership from the top. Man of the Match? You must be joking! This is how you do the fans area Saints. Compare this to behind the Kingsland, or Itchen! Van Dijk a Saints for how long?